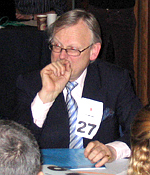 “Lord Deben, Chair of the CCC” by mintyboy on Flickr. Licensed under CC BY 2.0 via Commons. The Committee on Climate Change (CCC) has just published its proposal under the climate change Act for the UK carbon budget for 2028 to 2032. It is 175 million tonnes CO2e for the 2028 to 2032. Last year following a piece by Carbon Brief, I took the IPCC’s remaining carbon budget for a 2°C rise in global temperature. (We are just passing the 1°C mark.) I divided this remaining budget by the number of people in the world to get a world budget per person. This gave 115 tonnes of CO2e per world citizen. The CCC’s budgets from 2015 to 2032 amount to 7,650 million tonnes of CO2e. That is 118 tonnes CO2e per UK citizen. This exceeds the world personal budget of 115 tonnes already. HOWEVER (as Mona Lisa Vito says in My Cousin Vinny), our government budgets are false budgets because the UK carbon budget is measured on a production basis (i.e. They only count CO2 emissions from what is produced in the UK). The budget does not include the embodied carbon in imports. This leads to the nonsense that closing UK steelworks lowers UK emissions, while actually increasing our real emissions. We should probably double the figure for official emissions for this reason and some others like the underestimation of methane’s power. Worse still, the IPCC budgets are too liberal because their models had missing feedbacks. Perhaps the rest of the world will help us out and stop driving cars, eating beef and building with steel and concrete. The Committee on Climate Change should really tell the whole truth – and loudly. – and the Friends of the Earth described him as “the best Environment Secretary we’ve ever had”. We did the same and got the same result. 115 tonnes per Person. Developing an app to help people work out their personal carbon budget. Personalcarbontracker.weebly.com .